Limited counter space? Portable Wire Counter Display Rack will fit on any counter or table! 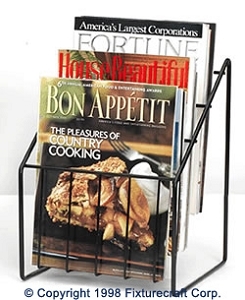 Mini Maggie display is a 3 tier heavy gauge wire literature counter rack designed to show off your 8 1/2" x 11" magazines or brochures within a very small area. Model C3 is Fixturecraft's most compact Wire Display Rack for the counter. The base is only 9" deep x 9" wide, but still holds plenty of magazines or literature. Each pocket holds 1 3/4" of your material while showing off the top 1 1/2" of your product. Mini Maggie's three wire pockets Magazine Display overlap enough to save you space, but still make it easy for customers to see your literature. Great little rack for all your conferences and trade shows.